Are there any no delivery zones? FlowerStore can deliver or reach almost everywhere within the United Arab Emirates. But there are some areas with respect to delivery just because of their remoteness and some areas have their own delivery restrictions such as armed forces. What measures are taken so that my order arrives in a perfect condition? All products are delivered through FlowerStore with our own courier vans. Every essential evaluation is taken to make sure that the product arrives to the receiver in perfect condition and having a smile on the receiver face as it is our utmost priority. If a product is broken during arrival, please let us know as soon as possible, we will take every feasible step to rectify it. Is the same day delivery possible? Same day delivery will be applicable on these hours. How an order is placed? Our Online Flower Store is very convenient and easy to use; user will never face any difficulty to place an order. However, we will take your order; (i) Online, (ii) Through Live Chat, and (iii) By Phone. (i) Online - Once you have selected the item, please click on Shop Now and proceed to Secure Checkout. (ii) By Phone - Please call + (971) 4 5531019 during our office hours (8AM - 6PM GST Daily). (iii) Through Live Chat – Just clicking on our "Live Help" option during our office hours (8AM - 6PM GST Daily). What options are available for the payment? Payment can be accepting through Credit Card such as VISA, Mastercard, American Express and Discover. Am I secured while using my Credit/Debit Cards for Payment? Will my Contact and other Information be Kept Confidential? Our utmost priority is to secure the personal information of our customers. Our company hasn’t share customers personal information for the use of third-party or sells it to marketing agencies. In case of any legal requirement such as fraud, or law-enforcement request, here we are bound to give your personal information may be shared upon request from the related government authorities. What is the process of order cancellation and refund policy? We will 100% refunds you if the order cancellation request will be in 24 hours after placed the order. If the order has been shipped, the shipping fees are not refundable. In the case of perishables like flowers, chocolate, fruit, etc. 50% of the product amount is also not refundable. Is it possible to Deliver Order on a specific Date and Time? 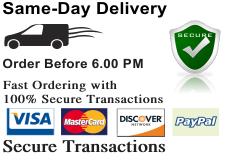 Definitely, we promise to deliver your order on your requested date. As far as delivery time is concerned, kindly mentioned the time in order placing given form so that we can deliver with the that specific time. However, an accurate timeline cannot be guaranteed. Order deliveries are made among the time range that you have been selected during checkout. Can a Delivery Be a Surprise? Yes off course, but only we can do this with the customer special instructions orders are delivered as a surprise. Recipient will never know before until our team will reach there to deliver. We promise to make the surprising memorial day of recipient life. Yes, we do delivery anonymously. If the recipient doesn’t want to accept anonymously then gift will be return to us. Is there any Guarantee that the product will be delivered in a Good Condition at Right place? In our Online Flower Store all flowers and perishables products are prepared fresh each morning. We use temperature controlled vehicle to deliver flowers and perishables gifts. If you are not satisfied with the quality of the product after getting our present do not hesitate and feel free to contact us. We are here to fix the issue and serve you in a best possible way because our top most priority is our customer. Yes, it’s our company policy (but not applicable when surprise delivery) to call the recipient before delivery to make sure the correct address, and the confirm recipient is at that address at the time of delivery. What happen when the recipient is not available on the delivery spot at the time of delivery? If the recipient is not available at the time of delivery, then our sales agent will directly call to the sender to reschedule the delivery time. If you ordered flowers, chocolates, or other ripe gifts, then all items are prepared again on next morning to keep freshness. Your pleasure is must and surely guaranteed! What is the Minimum Value for Placing an Order? The minimum value for placing an order is AED 95 (US $26), for Abu Dhabi and other northern emirates (i.e. Fujarirah, RAK, UAQ Alain) a minimum order of AED 700 falls in our delivery policies. How will I come to know My Order has been confirmed? After submitting an order you will receive a confirmation email within 1-2 hours. If ordering through Google Checkout, you will get an order received email from Google Checkout. If you haven’t received any email from us due to some technical problem within 2 hours, kindly Contact us to our customer service team as soon as possible for assistance. How will I come to know if my order has been delivered safe and sound? 1. First email you will receive about confirmation of your order. 2. Second email will be related to tell you that your order has been dispatched. 3. Third email you will receive when your order will be delivered safe and sound. Can I have Gift Wrapping for the products purchased on FlowerStore? Certainly, our eye catching gifts design team will alter your gift into an attractive presentation before deliver. A particular instructions by customers for wrapping option can be given or demand it from a customer service agent. What Happen If I want to make changes in my order? We try our level best to make every possible change before order has been out for delivered. If still you wants to make any other changes then let us know through email or contact FlowerStore on +(971) 4 5531019 (UAE only) and ensure that you have your order number.